This blog post provides a resource to teach ESL students/ELLs the use of direct and indirect quotations. Adapt the following information according to students' levels and needs. Note that the example sentences provided employ simple vocabulary and word constructions to accommodate low-level students. Example sentences can be modified to be more appropriate for your students' levels, interests, and content areas where this instruction will be applied. When you write a person’s exact words, it is called a direct quotation. You use quotation marks around a direct quotation. The verbs most often used with direct quotations are said and asked. The word said means that someone spoke words. It is used for imperative, declarative, and exclamatory sentences. The word asked means that someone presented a question. It is used for interrogative sentences. “Pam had a job,” said Dad. “Is Mom sad?” asked Ned. When you write what a person said but not his/her exact words, it is called an indirect quotation. For these quotations, you don’t use quotation marks. The phrase most-often used with indirect quotations is said that. Dad said that Pam had a job. Ned asked if Mom was sad. Teacher's Note: Students should note that verb tenses can change in indirect quotations, but right now, they should focus on the quotation marks. 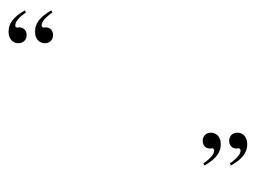 Use quotation marks before and after a person's exact words. "The dog ran on the sod," said Mom. If a person's words are interrupted by other words in the sentence, use quotation marks only around the person's exact words. "That sod," he said, "was a big job." Capitalize the first word in a quotation, even if it's not the first word in the sentence. Mom said, "The dog is in the den." After an interruption, do not capitalize the next word unless it starts a new sentence. "The dog," Mom said, "is in the den." "That is good," Dad said. "He gets no ham." Use a comma to divide the spoken words from the speaker. Always place the comma before the quotation marks. Mom said, "He will beg." "He will beg," Mom said. If the spoken words end in a question or an exclamation mark, do not use a comma afterward to separate the words from the speaker. "Is Jen in bed?" he asked. "I am in the den!" she shouted. Always put a period inside the end quotation mark. Put a question or an exclamation mark inside the quotation mark if the spoken words are themselves a question or an exclamation. He said, "You have a job." She asked, "What is it?" Use a new paragraph, and indent each time the speaker changes. that, you can go to bed." "No ham for you!" Mom said to the dog. Make an activity page from the items below. Have students indicate if the following sentences are direct or indirect quotations by having them write the letter d for direct or the letters id for indirect on the blank before each sentence. Then have students add proper punctuation and quotation marks. The first two are done. NOTE: Information in this blog post is adapted from the Decoding Strategies for Literacy Development manual published by Reading Horizons and is used with permission.